Google is being sued by PayPal, which claims that the internet search giant stole its technology for turning smartphones into digital wallets. PayPal alleges that Google obtained trade secrets from Osama Bedier, a former PayPal executive who is now Google's vice president of payments. 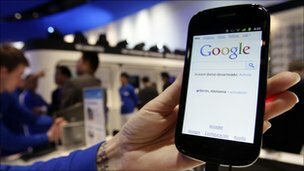 The lawsuit came hours after Google unveiled its plans to allow people to pay for shopping with their mobiles. Google said it had not yet seen the complaint. "We have not yet received a copy of the complaint and won't be able to comment until we've had a chance to review it," a Google spokesperson said. Google intends to launch its mobile wallet technology in the US in the summer. It plans to offer the service on mobile phones that use its Android operating system. Payment processor PayPal, which is owned by online auction site eBay, also claims in its lawsuit that Mr Bedier was in job talks with Google at the same time as he was leading negotiations to make PayPal a payment option on Android. The technology that allows mobile phone users to pay with their handsets in shops is called near field communications or NFC. It is already used in Japan, and is predicted to become popular around the world. PayPal says it spent three years trying to secure a deal under which it would create an NFC system for Android, only for Google to end the talks. In its court filing, PayPal said: "By hiring Bedier, with his trade secret knowledge of PayPal's plans and understanding of Google's weaknesses as viewed by the industry leader, Google bought the most comprehensive and sophisticated critique of its own problems available." "Google put Bedier in charge of its mobile payment business, virtually ensuring that Bedier would misappropriate PayPal's trade secrets concerning planning and competitive assessments in mobile payment." Mr Bedier was hired by Google in January of this year.